Jessica Herzog, a natural resources management student, won first place overall Tuesday at the 2017 Research and Creative Activity Day hosted by URSA. Her research poster on golden eagles’ diets was chosen from more than 100 entries displayed Tuesday on the first floor of Wood Center. The event is an annual celebration of undergraduate student research and creative projects. Each school chose a Dean’s Choice Award and representatives from URSA, Undergraduate Research Scholarly Activity program, picked the top three finishers. 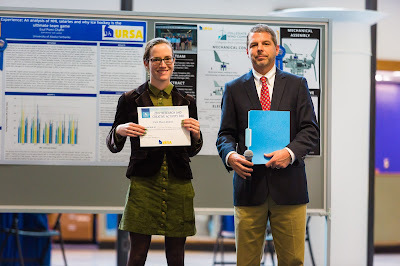 Herzog’s poster also received a Dean’s Choice Award from the School of Natural Resources and Extension. She will receive $250 for her SNRE award and $1,000 for her first place overall. The event was reminiscent of a science fair with undergraduate students standing by their projects to discuss their work. Research and creative posters ranged from tsunami wave action and engineering projects to costume design and food sustainability. Six students from the School of Natural Resources and Extension displayed their work, including Trish Levasseur, Kimberly Diamond, Zoe Marshall, Roger Ridenour and Kelly Schmitz. Herzog said the point of her project was “to see if male and female eagles consumed a different size of prey to avoid competition.” Niche partitioning refers to the process by which competing species use the environment differently in a way that helps them coexist. Golden eagle females are larger than males so she theorized that males might eat smaller prey. Her project built on undergraduate research done by Joseph Eisaguirre, who is now a doctoral student with the UAF Department of Wildlife and Biology. As part of her research, Herzog analyzed his data and she examined 349 regurgitated pellets and 52 uneaten prey remains from nests and perches. They were drawn from 46 occupied eagle sites visited in 2014 and 2015 by Eisaguirre and wildlife biologist Travis Booms, who is with the Alaska Department of Fish and Game’s Threatened, Endangered and Diversity Program. They assumed that perch samples were from males and nest samples came from females. Trisha Levasseur stands by her research poster that analyzes a visitor survey. Herzog, who is a junior, hopes to continue to study predator-prey relationships as a graduate student. She is from Butte, Montana. SNRE Academic Director Dave Valentine, who chose the dean’s award after consulting with Research Director Milan Shipka, said it was hard to choose among the projects. • Trisha Levasseur, with mentor Pete Fix: “Recreation and Travel Across Federally Managed Lands in Alaska: Analysis of Management Meeting Informational Needs of Visitors.” She examined data collected as part of a visitor survey conducted last year in Alaska to determine what type of information is sought by different types of visitors. • Kimberly Diamond, with Gino Graziano and Katie DiCristina, “Factors Impacting Dormancy and Viability of Prunus Padus Seeds.” Diamond studied the dormancy and viability of invasive bird cherry seed. • Zoe Marshall, with mentor Pat Holloway: “Vegetative Propagation of Four Northern Berry Species to Promote Sustainable Fruit Production in Alaska.” She explored methods of cutting propagation to seek the best way to propagate honeyberry, haskap, Saskatoon serviceberry and blueberries.